From the earliest origins of animated imagery, the colorful link between paper and screen was created by legions of female artists working on the slick surface of celluloid sheets. With calligraphic precision and Rembrandtesque mastery, these women painstakingly brought pencil drawings to vibrant, dimensional life. Yet perhaps as a reflection of the transparent canvas they created on, the contributions and history of these animation artists have remained virtually invisible and largely undocumented, until now. Walt Disney's pioneering efforts in animation transformed novelty cartoons into visual masterpieces, establishing many "firsts" for women within the entertainment industry along the way. Focusing on talent, Disney sought female story specialists and concept artists to expand the scope and sensibility of his storytelling. Upon establishing the first animation-training program for women, ink pens were traded for pencils as ladies made their way into the male-laden halls of animation. World War II further opened roles traditionally held by men, and women quickly progressed into virtually every discipline within animation production. Disney's later development of the Xerox process and eventual digital evolution once again placed women at the forefront of technological advancements applied to animated storytelling. 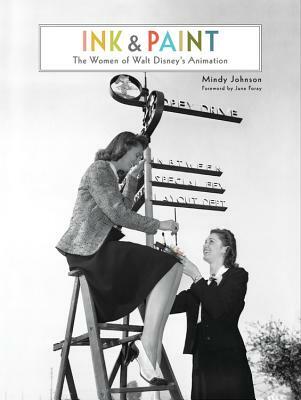 In her latest landmark book, Ink & Paint: The Women of Walt Disney's Animation, author Mindy Johnson pulls back the celluloid curtain on the nearly vanished world of ink pens, paintbrushes, pigments, and tea. From the earliest black-and-white Alice Comedies to the advent of CAPS and digital animation, meet the pioneering women who brought handrendered animated stories to vibrant, multicolored life at Walt Disney Studios and beyond. Extensively researched with the full support of the entire Walt Disney Studios archival resources, plus a multitude of private collections, firsthand accounts, newly discovered materials, and production documentation, as well as never-before-seen photography and artwork, this essential volume redefines the collective history of animation. Award-winning author and historian Mindy Johnson once again takes readers on an epic journey into the unexplored realms of our shared past. Her critically acclaimed debut title, Tinker Bell: An Evolution, which chronicled the development of everyoneâs favorite fairy, was honored with consecutive Family Choice Awards. A contributing writer for The Walt Disney Film Archives: The Animated Movies 1921â"1968 (Taschen Publishing) and the celebrated book Marc Davis: Walt Disneyâs Renaissance Man (Disney Editions), Mindy is a frequent speaker and writer on early cinema, animation, womenâs history, and creativity. Sheâs also an award-winning playwright, songwriter, musician, and contributing artist on several internationally acclaimed recordings. Mindy continues to teach, write, and consult for various entertainment entities . . . between tea breaks.